Tired of the same old fishing shots you get every time you go out? Ever wanted to try some underwater shots like the ones you see in magazines and product shots, or like some of those taken by the photographers on this site? If you’ve ever looked at the possibility of a getting an underwater housing for your DSLR, then you’ve probably ended your dreams of shooting underwater right right there. Most true underwater housings, no matter the cost of your camera tend to be in the multi-thousand dollar range. I know a housing for my Nikon d700 starts in the $3000 price range and can get up to about $5000 depending on the make and model. There’s now much cheaper solution. $130 dollars to be precise. Granted you can’t shoot hundreds of feet under water, but the aquapac does have a stout acrylic lens, clear bag for composing, and relatively simple way to operate the buttons. I’ve had one for about a year now and while the closure seems a bit sketchy, it’s never once failed on me. It does take some getting used to the awkwardness of holding and shooting through thick plastic though. 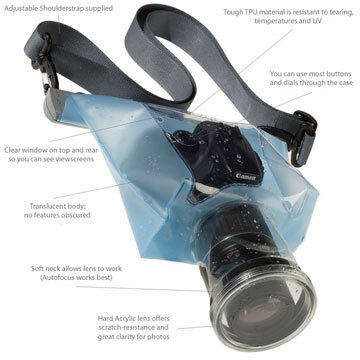 I won’t advise going deep, but for that once-in-a-lifetime release shot or if caught in the midst tropical downpour, this gadget should have you covered.